Forgotten because of the spectacle that was Dunkirk and because of the attention that was (rightly) paid it, audiences mostly missed the other England Losing WWII Before It Had Even Started movie, and that was Their Finest. I don’t mean to sound dismissive of the horror of the Blitz or to the beginning phase of the War, the release of these films has simply alerted me to the fact that most people don’t know the history behind the story or behind the first battles, which is fairly shocking. Too many people asked me “what’s Dunkirk?” when I mentioned that they had to see the film; I knew this was more obscure than D-Day, but I didn’t know it was that unknown. Anyway, two movies tell the tale, one through intense realism and one through comedic storytelling. The first is much better, which you probably already know if you’ve been hooked in to any social media, but the second is slightly disappointing, which I did not see coming. After the events at Dunkirk, and while England shelters in its tubes, waiting for Germany to finish off its armies, a once-proud people begin to lose faith that their country will survive Europe’s largest war. Hitler and his Nazis are marching free across the continent, America seems uninteresting in joining sides, and hope seems absolutely lost. This is the time for propaganda to shine if ever there was one, and the film department of the Ministry of Information is on the job. The mission; to create a movie that will lift the spirits of a nation, to bring a true story to life that will inspire a war effort. Two screenwriters, Catrin Cole and Tom Buckley, make it their goal to pen a picture that will make a world of difference. 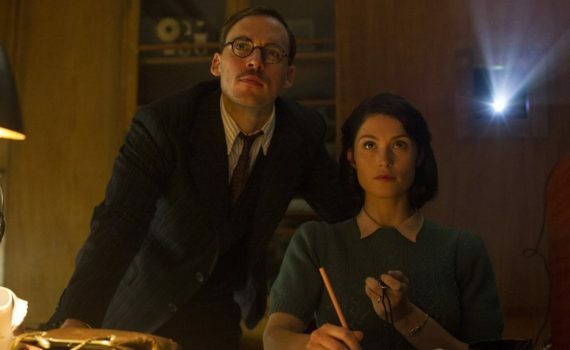 Their Finest is a good example of a smart idea that wasn’t exactly executed to match its potential. You’ve got real history to work with, a unique idea to act as a vehicle, a solid cast to perform the action, and yet the final product isn’t exactly as flawless as I’d hoped it would be. The beginning is great, the comedy is welcome, and the heart is real, but the writing & direction really let the concept down about 90 minutes in. That’s around the time I lost interest, when the plot takes a weird path that you both saw coming and didn’t want to watch. I’m not sure who made the ultimate decision on the direction this movie would take, but someone made a mistake. Up to that point, Bill Nighy was stealing the show, Eddie Marsan (who is extremely underrated; Filth, A Brilliant Young Mind, The Exception) was delighting us all, and everything was going swimmingly. Gemma Arterton never really took control though, the ending was disappointing, and the overall vibe I got from the film was that someone lost control of what could have been a great thing.